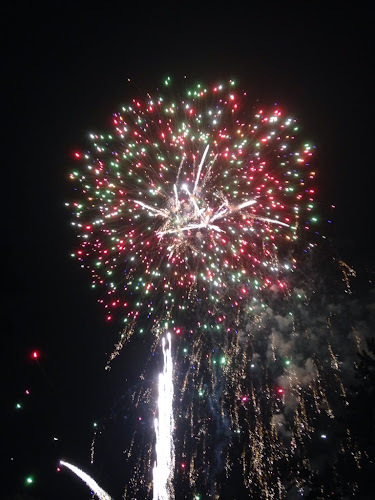 Saturday night, we spent a wonderful evening at our club, enjoying a fireworks display, to kick off the 4th of July holiday week. It was a beautiful night to spend outside, with temperatures comfortable, as the sun slowly set. Our table on the patio had a perfect view of the golf course and the fireworks to come, as we enjoyed a few summer cocktails, before dinner. There was a buffet to enjoy, filled with picnic salads, chicken, and even prime rib. When darkness arrived, the fireworks began and there is something about those loud booms and bursting lights that bring out the kid in us all and stir our memories of 4th of July celebrations, over the years. 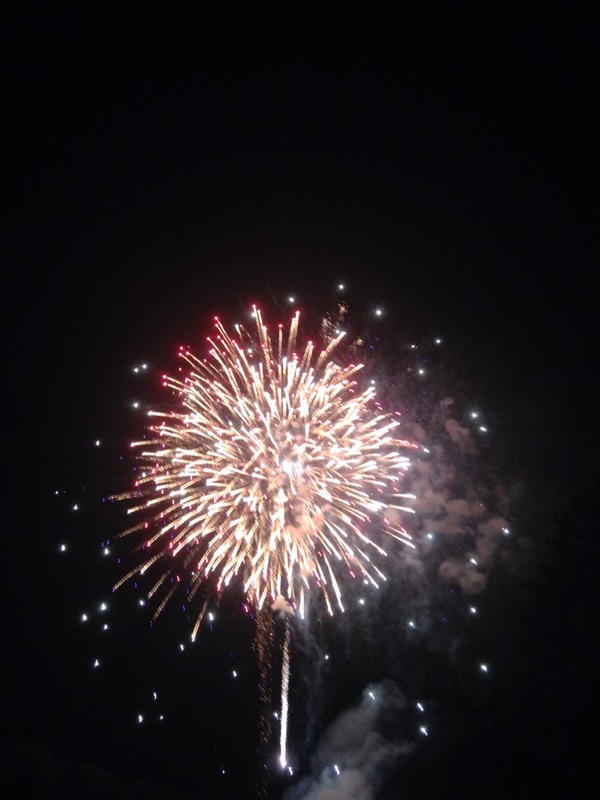 We remember 4th of July celebrations, from the past; sitting on blankets at our hometown parks and beaches. We still look up with wonder and awe, anticipating each beautiful display of sound and light. A perfect way to celebrate America. What are your favorite fireworks memories? June and strawberries just go together in my mind. I've made strawberry shortcake this week and even had a strawberry shortcake waffle for breakfast. So, with strawberries on my mind, I decided to make some strawberry jam using my tried and true, easy recipe. I have made yummy peach jam, using fresh peaches and even blueberry jam using frozen blueberries. Any kind of homemade jam is like a little bit of summer sunshine on your morning toast or english muffin. 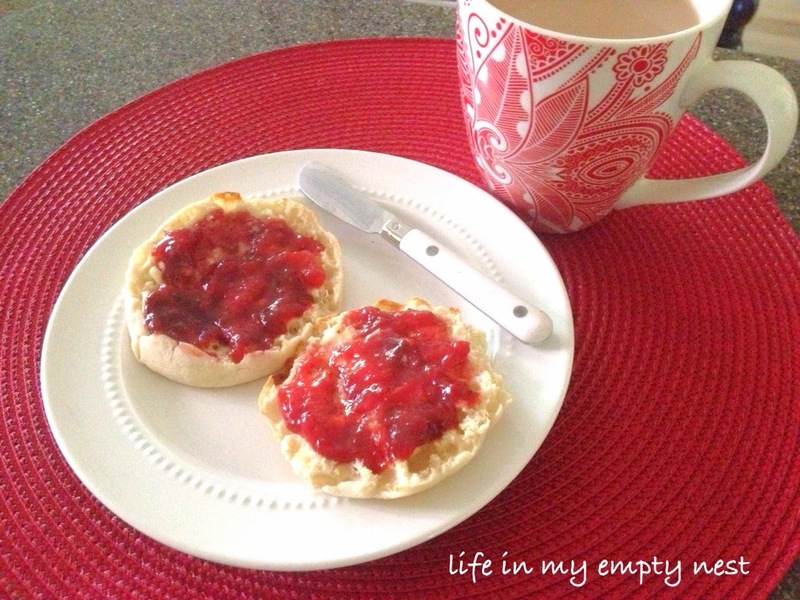 This recipe is great because I can use Splenda, and make this jam low carb. When it was cooking, the scent of strawberries filled my kitchen, as this easy jam came together, in just minutes. No pectin, no boiling jars required. 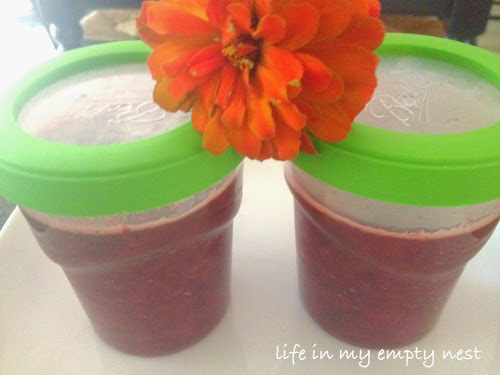 The recipe requires two freezer jars and I fill one to use right away and one to freeze for later. Cut tops from strawberries and slice in half. Place in large pot with sugar (Splenda), lemon juice and splash of water. Bring to boil and cook for 40 minutes until liquid reduces and strawberries are soft. Scoop carefully, with slotted spoon, into 2 freezer jars. Liquid will set, once jam cools. Enjoy! My book club met last night, and it was a really lovely evening, as always. We started the evening with mojitos and appetizers of grilled shrimp and a beautiful cheese platter, along with other assorted nibbles, then moved into the dining room for greek salad with grilled chicken and grilled pita bread. We were so comfortable there, we stayed around the table for our book discussion, which was lively as always, even though the book had its flaws. The dessert served at the end of the evening was definitely a highlight for me, because anything lemon is my favorite flavor. 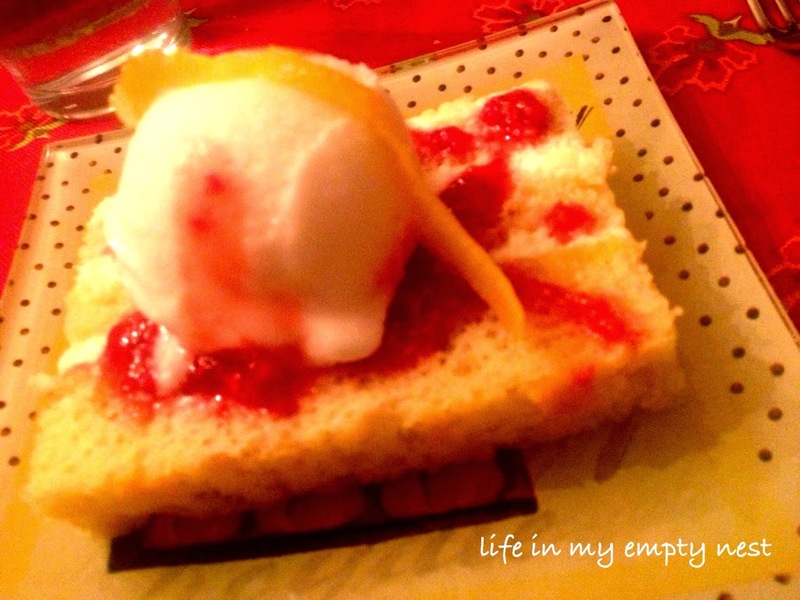 Our hostess put it together, by slicing a lemon layer cake and topping it with a scoop of lemon sorbet and a sauce made with fresh raspberries and chambord. 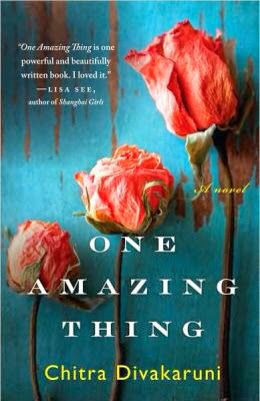 The book we read, One Amazing Thing by Chitra Divzkaruni sounded promising in its premise. A group of strangers are trapped in a building after an earthquake and decide to get through their ordeal by telling a story of one amazing thing that has shaped their life. Somehow, though the stories were interesting, this book fell short in its depiction of the characters and their struggles to survive their entrapment. There was a disconnect between the stories they told of their past and how they were portrayed in real time. The premise my book club did agree on is that everyone does have a story of what they are dealing with and most likely doing the best they can. We all need to remember this as we meet and deal with difficult people in our daily lives. It's time to celebrate America with red, white and blue decor and recipes. We always fly the flag on the 4th of July, but I also love to have a few patriotic touches, here and there, in my home. These three simple ideas - 2 DIY projects and 1 recipe will give you inspiration for making your 4th of July holiday extra special this year. First, make an easy patriotic banner by using an assortment of heavy stock scrapbook paper. I simply cut out the shapes from a template and hung them by using red and white baker's twine. I think the patterns are unexpected, but fun. The complete tutorial can be found here. Next, this framed print is easy to put together with a simple white frame and some red white and blue embelishment, found at any craft store. 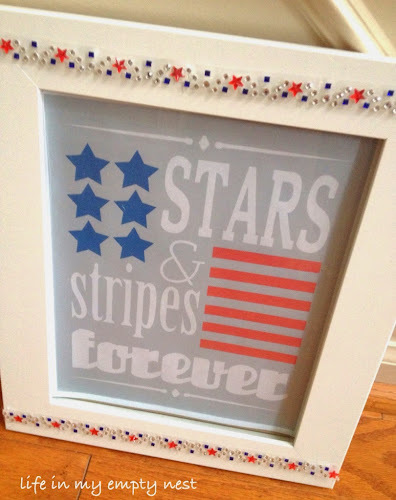 See how I used this print on a patriotic mantel and find the link to the free printable, by clicking here. Finally, take something sweet to your Fourth of July picnic or event, by making these easy red, white and blue, white chocolate dipped strawberries. 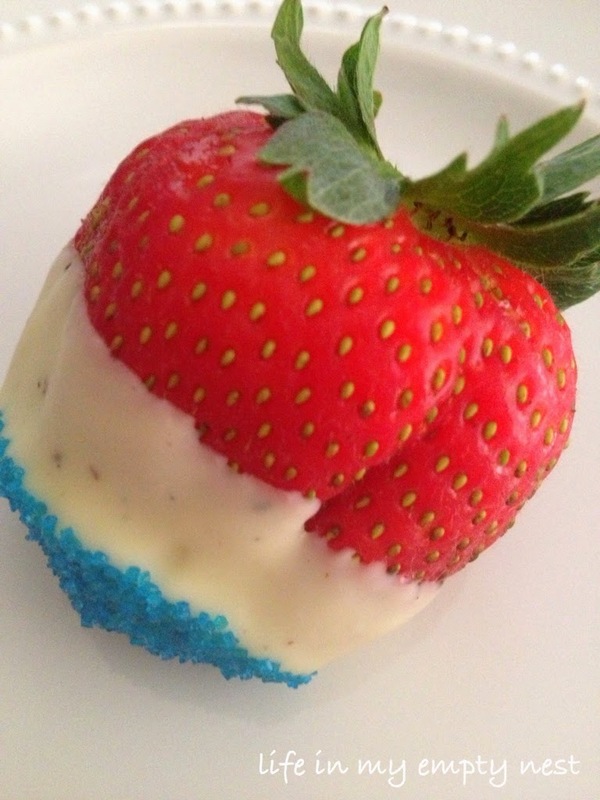 The recipe for this pretty, delicious and patriotic dessert can be found here. 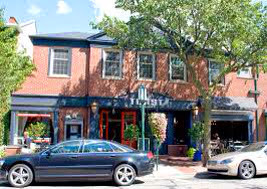 On the first official day of summer, what better spot to eat breakfast, than an outdoor table at a wonderful little cafe? My daughter Melissa and I went on an impromptu shopping trip, to a neighboring city, on Saturday and began the morning at the perfect restaurant, where it was so lovely to enjoy the beautiful summer weather and catch up with all her news and plans. French doors were open, wide to the street and we were seated in in the best spot to watch the people strolling by and outside enjoying their day. 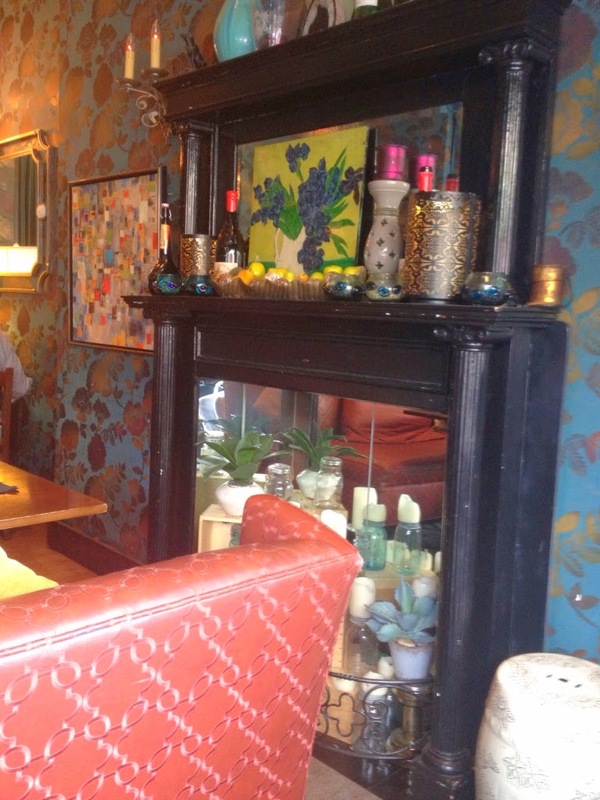 The decor was an eclectic mix of patten, color and comfortable sofas and chairs, beckoning you to relax, stay a while and enjoy your coffee. 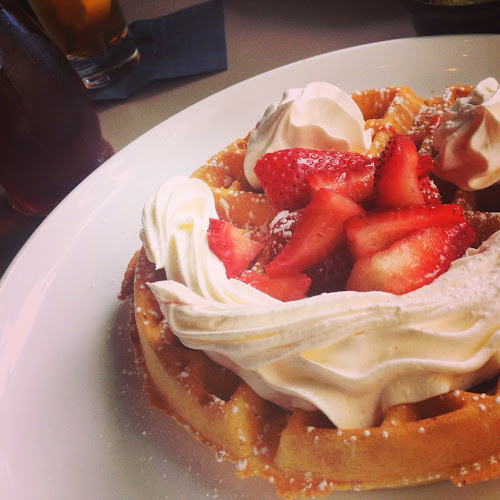 Since it was the first day of summer and strawberry season, I couldn't resist ordering the strawberry shortcake waffle. It was so good; light, crispy and topped with delicious homemade whipped cream and fresh strawberries. While I went for a sweet option, my daughter chose a greek omelet, that looked delicious too. 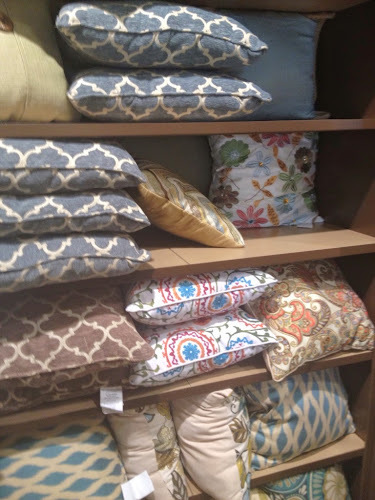 My sweet blog friend Lauren from Simply LKJ was kind enough to tag me in this blog question and answer series going around and I thought it would be fun to answer them today. Lauren is an empty nester like me, the mother of two girls like me and getting to know her through blogging has been a treat. She even has a mother in law who lives in Michigan, so we have that connection too! 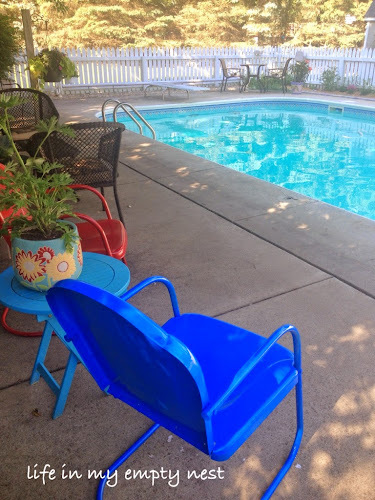 By doing this today, maybe you will learn something new about me whether you are a long time reader, or new to this blog. 1. Are you named after someone? Yes, I am named after my Mother's best friend. I didn't really like the name Victoria when I was younger, but started using it for business and grew to love it. Everyone I know still calls me Vicki or Vic, if they really know me well. 2. When was the last time you cried? That is easy - when my daughter Megan moved to Pittsburgh about a month ago. It wasn't a big cry; just a little misty eyed when she pulled away in her car. I miss her. 3. Do you have kiddos? Two daughters. Megan is 24 and Melissa is 20. 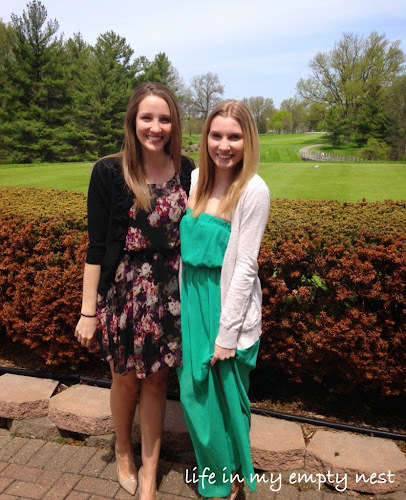 Having grown up daughters is a new experience and very fun! 4. If you were another person, would you be a friend of yourself? I hope so and try to be a thoughtful and loyal friend. Isn't that the best thing someone could say about you - that you are a good friend? 5. Do you have a guilty pleasure? Since I am a diabetic, my guilty pleasures are all the things I shouldn't have, but indulge in from time to time. Sometimes I like to have that second glass of wine, or that handful of M and M's. As long as it is a rare occurrence, everyone needs a splurge or life is just boring and predictable. 6. Do you like your handwriting? I don't hate it, but don't really love it either. 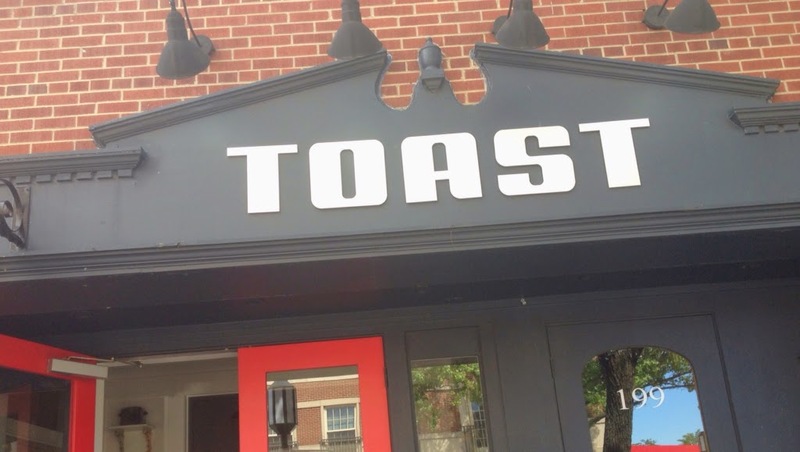 It seems to have become a combination of printing and cursive over the years. 7. What's your favorite cereal? Special K with red berries. 8. What's the first thing you notice about people? Their smile. I don't care for people who look unhappy and frown a lot. 9. What's the color of your eyes? Green. I like that they are unique. 10. Scary movie or happy endings? Definitely happy endings. I hate, hate, hate scary movies and don't even watch the previews, if I can help it. I was traumatized when I saw The Exorcist in high school! 11. Favorite TV shows? All the BBC show like Downton Abbey, Call the Midwife and Last Tango in Halifax. I also enjoy the Real Housewives and The Bachelor, but mostly watch now to read and appreciate the funny and snarky recaps the next day. My new favorite show, which I have been catching up with on Netflix is Parenthood. What great characters and real life situations. 12. Summer or Winter? I actually like whatever season I am in at the time. But, Winter is too long here in Michigan. Could it please be over at the end of January? 13. Hugs or kisses? Hugs! 14. Do you have any special talent? I think a talent that is dying out is being able to sew. I regret never teaching my daughters how to sew and use a sewing machine. 15. Where were you born? Adrian, Michigan. I grew up in various small towns in southeastern Michigan and coundn't wait to get away. I've learned to appreciate small town values, as time has gone by. 17. Do you have any pets? Yes, a Cockapoo named Cooper who is my walking buddy and a silly girl that makes me laugh every day. 18. Favorite movie? Terms of Endearment. I love a good tear jerker and this is the best. If it is on, I always watch. Gone with the Wind is my second choice. I will never forget seeing it at the movie theater when I was a young girl. 19. What color is your car? Black. 20. What do you want to be when you grow up? I'm happy with my life now. 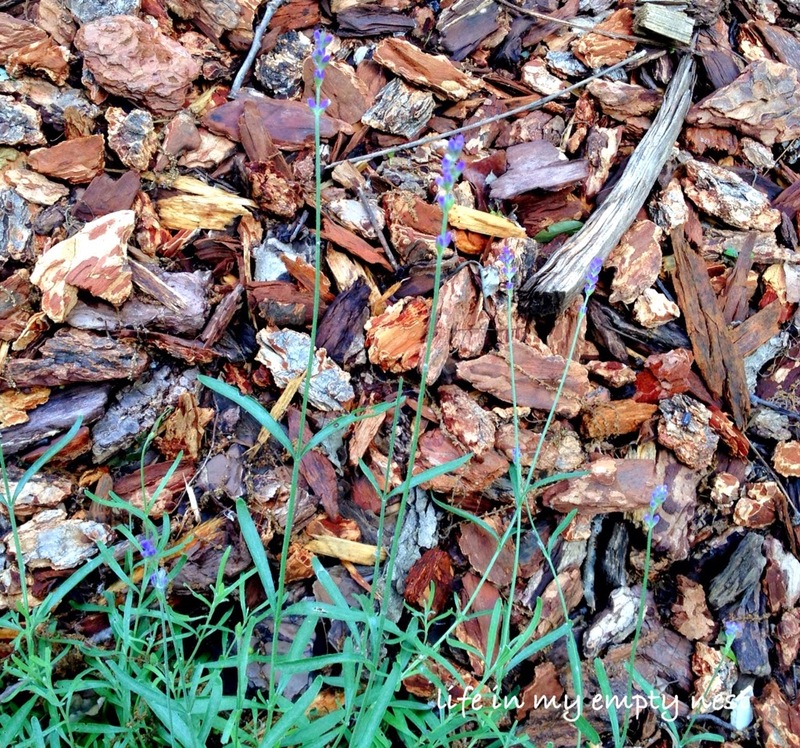 I believe in the quote " bloom where you are planted". This empty nest life can be a new adventure. I am not tagging anyone, but feel free to answer the questions on your own. Have a wonderful weekend! In between the major rain and loud thunderstorms we have been experiencing this week, I was able to sneak in some time to wander my garden and appreciate the flowers that are blooming. I noticed that I have an abundance of tiny blooms; sweet small flowers that nestle amongst the green leaves. The light purple hues of this Campanula are a lovely sight, spilling out of some pots and also nestled near some rocks. 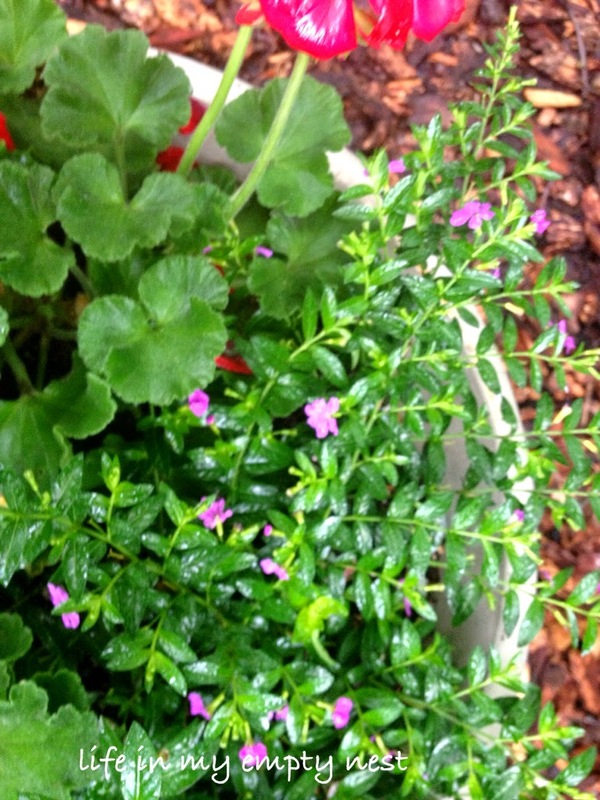 I love the bright purple color of the Mexican Heather, in contrast to its dark green foliage. My one patch of lavender is blooming profusely this year and the scent when you go near is beautiful and soothing. 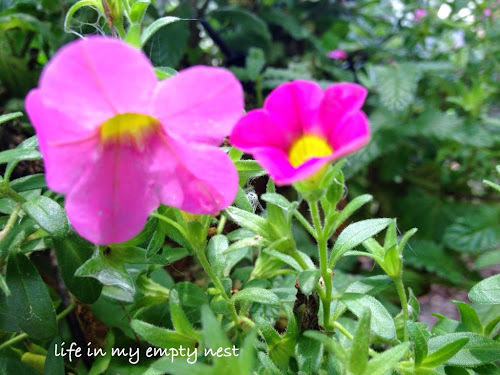 Pretty, pink and tiny petunias are just a happy flower and make me smile. 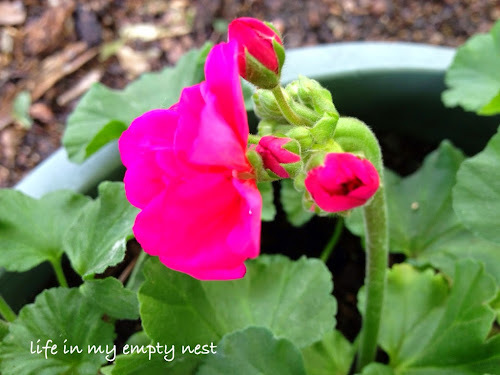 There is even a miniature geranium with more tiny buds, ready to bloom. Take some time to see what's blooming in your garden and Happy Thursday! 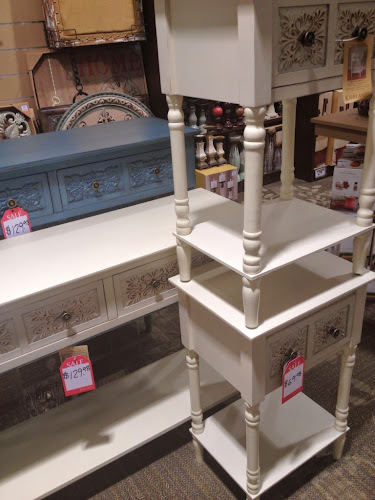 When I think of my time living in Memphis, one of the things I miss are the uniquely Southern stores like Dillard's, Steinmart and Kirkland's. 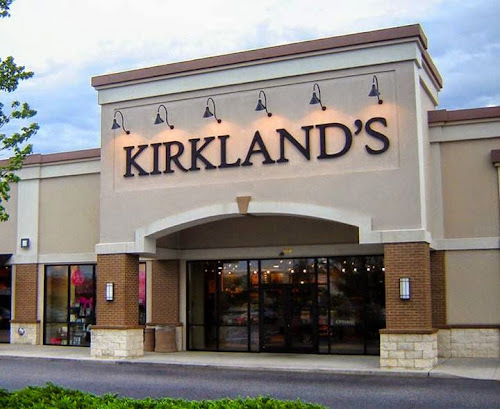 Imagine my surprise when I drove by and saw that a Kirkland's had opened, in a nearby shopping center. I remember that it was a great place for home decor items, and it was one of my go to places for decorating my new home, on a budget. My curiosity led me to visit the new store, iPhone in hand and see if it was the same as I remembered it to be. 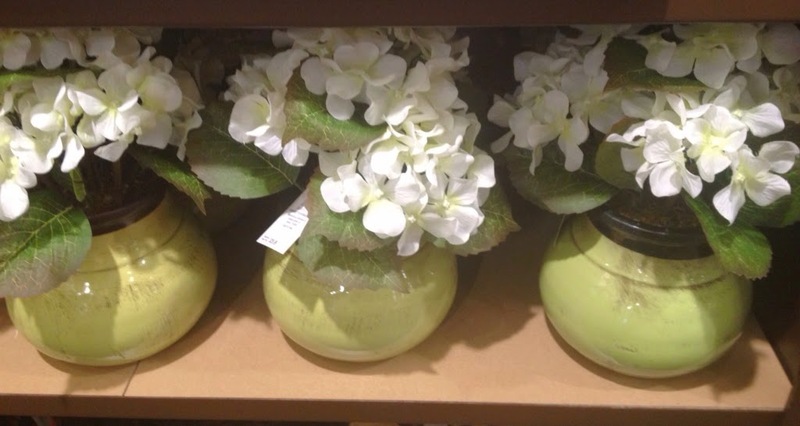 The store is fairly large and everything was displayed beautifully. 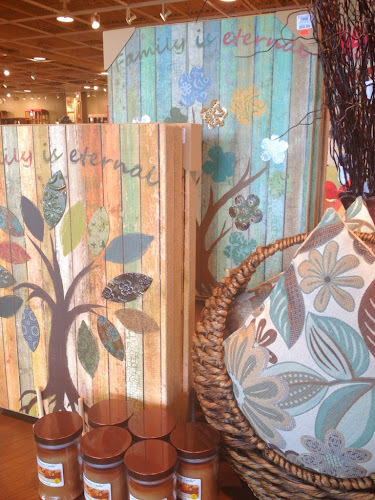 There was a unique selection of all sorts of home decor items from furniture to pillows to art. 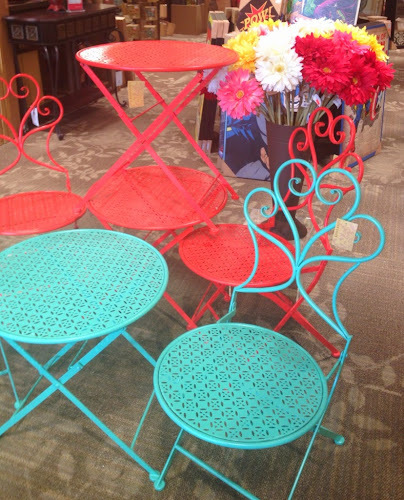 I loved the variety, the vibrant colors and the great prices. This store is very close to a HomeGoods and as much as I love shopping there, it does feel a little jumbled and unorganized at times. This new Kirkland's felt clean, spacious well very well organized. Though I wasn't shopping the day I stopped by, I saw many things I liked and look forward to going back, with my dining room update in mind. Sometimes in is the dressing that makes a salad great. Especially if it is homemade and complements all the ingredients, instead of overwhelming them. It is light and predominately tastes of fresh squeezed lime juice and the quintessential mexican spice; cumin. 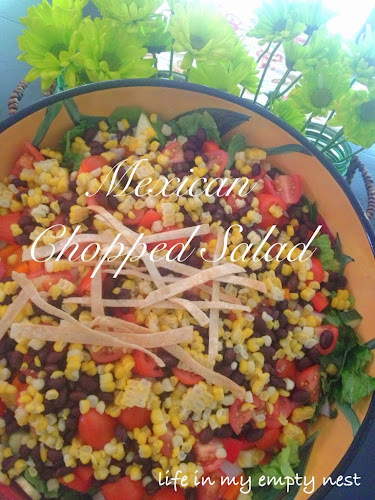 This yummy Mexican Chopped Salad that I prepared for our Father's Day cookout was really delicious and filled with all kinds of fresh chopped veggies, but the dressing was the star. The recipe can be found by clicking on the original pin here and will be a salad that I make often. It does require a little bit of time to make, because you are chopping up all the veggies into somewhat small pieces, making the dressing and even making your own tortilla strips. 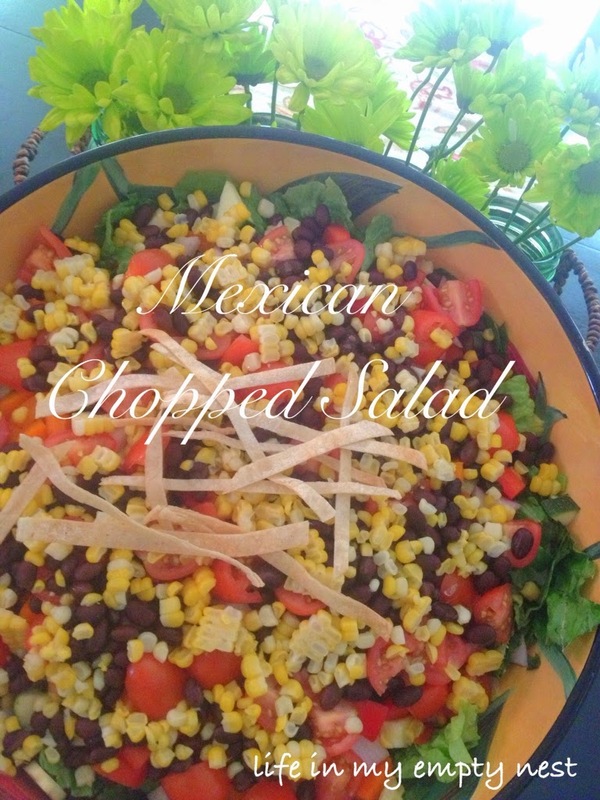 It is definitely worth the effort and all the colors of the veggies, especially the fresh corn, make the salad so colorful and pretty to serve. This was the kind of weekend, best told in snapshots. We went from one thing to to next; all fun, but making for a busy few days. It feels as if we are settling into summer, where days are spent outside and plans start to fill the calendar. The weather was picture perfect and we savored every moment spent with both friends and family. 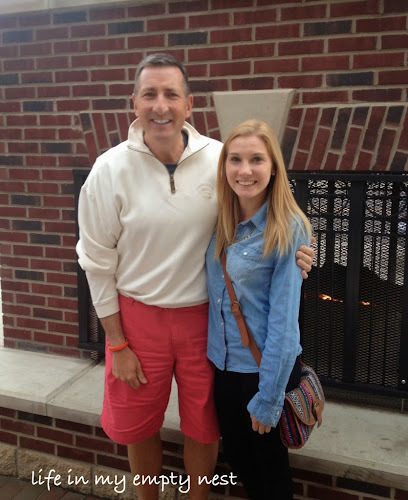 First, on Friday night, we drove to East Lansing to have an early Father's Day dinner with Melissa, since she was busy with her Pom team, the remainder of the weekend. 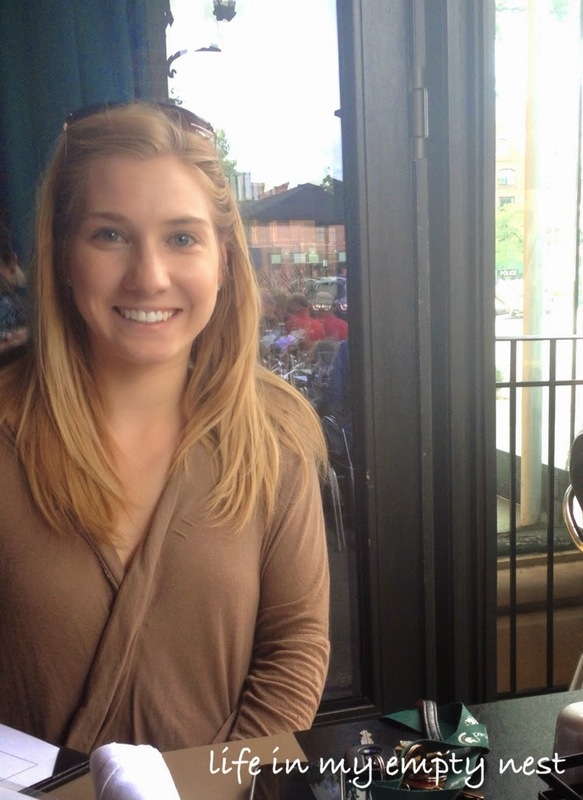 My husband chose our favorite mexican restaurant and though we missed Megan, we had a really nice time. It was a chilly night, so the outdoor fireplace felt great as we walked by. Saturday brought a bridal shower for my neighbor's daughter. It definately is the season of weddings for us this summer and I find bridal showers such a happy occasion. It's so special to see a girl you watched grow up, so poised and lovely, as their wedding day approaches and to be a part of that happiness. 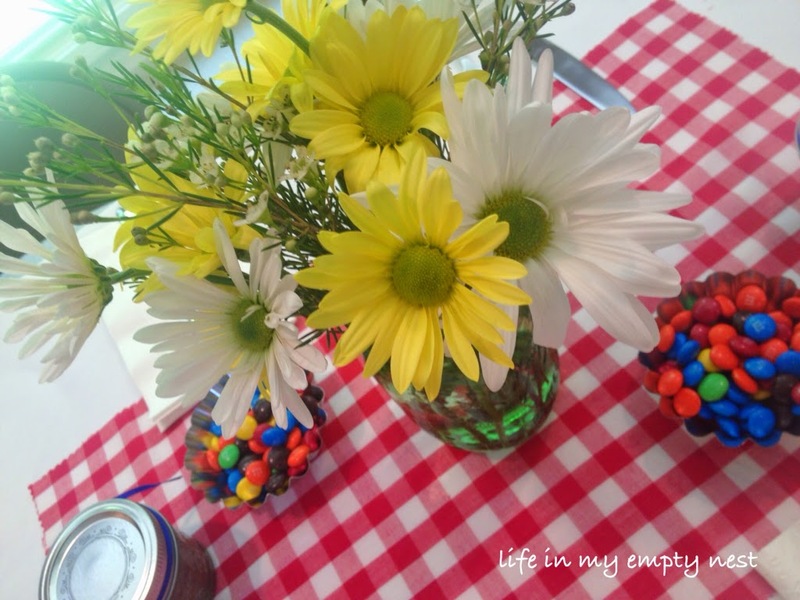 This shower had a picnic theme and the flowers were just lovely and so summery. 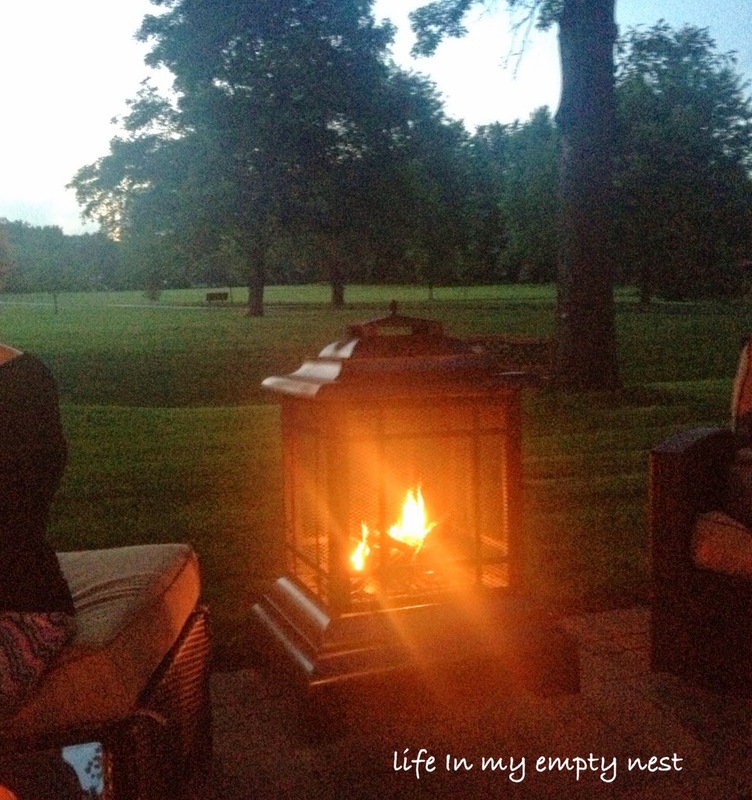 Saturday night we enjoyed a wonderful evening with friends; appetizers, wine and a patio fireplace. 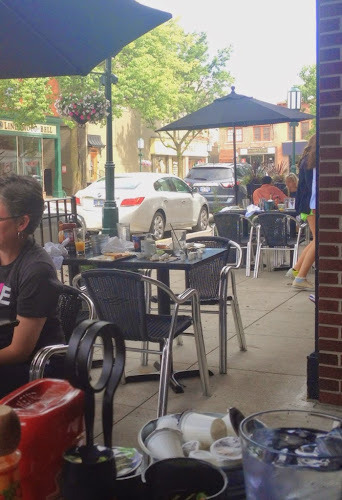 Warm days and cool nights make for the perfect Michigan summer and so far, it had been spectacular. Sunday afternoon, Father's Day was spent around my sister's inviting pool, as we celebrated all the fathers in our lives. We enjoyed a great barbeque and especially enjoyed being outside on a perfect summer day. For some reason, I have had trouble growing herbs. 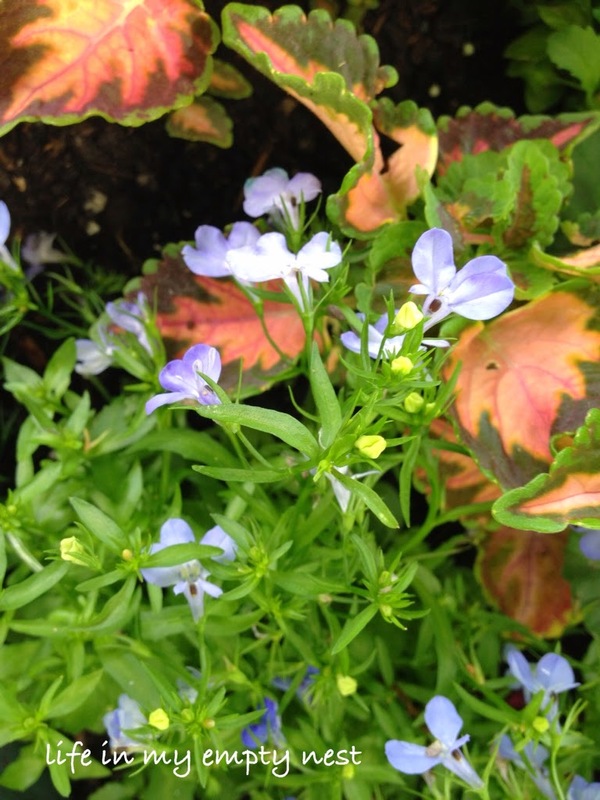 I have tried them both in my kitchen window sill and in the ground in my perennial garden. In the window, there was too much sun and in the garden, bugs were the culprit. But, I didn't want to give up completely. I envied those who talked about going into their garden and picking fresh herbs, for the dishes they were preparing. I planted a wide pot, with tall zinnias in red, orange and yellow shades, then nestled my herbs at the bottom. 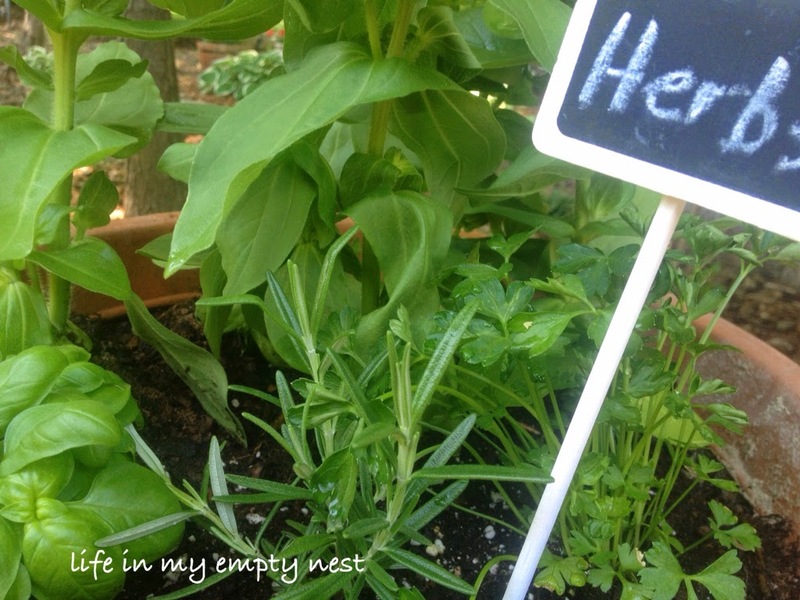 The herbs I planted are the ones I use most often; basil, rosemary and parsley. I have already used a handful of the parsley, chopped up and added to my Simple Parsley Butter New Potatoes. 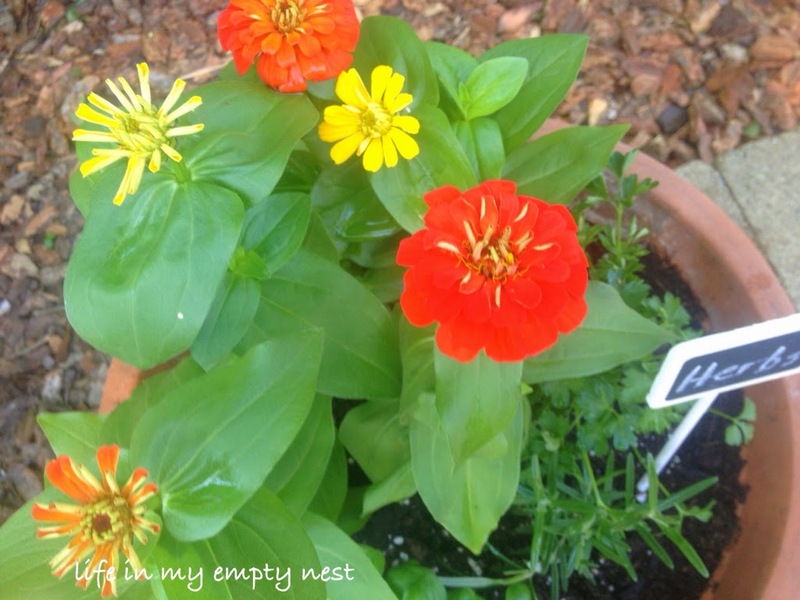 So far, both the herbs and flowers are thriving and as both grow, the pot will look so pretty with herbs spilling over the front and the zinnias growing tall in the back. 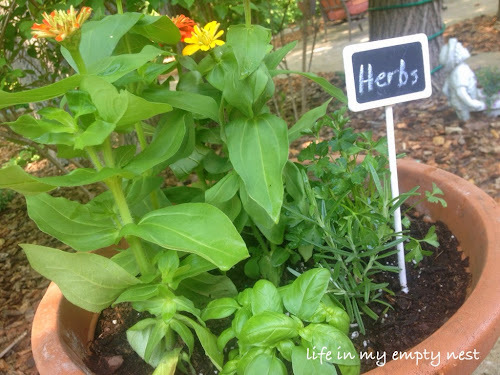 And, I will have fresh herbs to use, all summer long. When I read a book that surprises me, I always feel the need to write about it here on my blog. 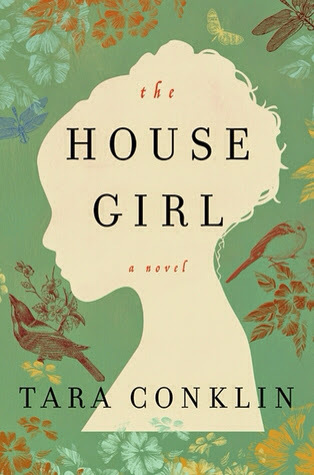 The House Girl, a debut novel by Tara Conklin, is a book that enthralled me from the very first page and stayed with me long after I finished. I saw the book cover on Sweet Pea's instagram and the beautiful cover art immediately drew me in, as well as the description of the story. It is always a book that I least expect to be something special, a book I decide to read on a whim, that ends up becoming so much more and that I am thankful to have read. The House Girl tells the story of two women; a house slave in 1852 Virginia and a lawyer in modern day New York. It is a story of love, history and ultimately a search for overdo justice. The author seamlessly weaves together the story of an escaped slave in the pre Civil War south and the lawyer who seeks to discover her history and use her story as part of a lawsuit seeking compensation for descendants of slaves. In her research, she discovers the slave girl might be the actual artist of her owner's famous paintings. The use of historical documents and letters to help discover the truth is riveting and the conclusion will have you unable to put the book down. When I made this combination of overnight oatmeal, I wasn't sure if I would like it, but what could I have been thinking? Blueberry and maple syrup give a hint of flavor, reminiscent of the blueberry pancakes I love. This is the perfect breakfast in a jar - its quick, easy and by using sugar free maple syrup, I even made it low carb. I am a big fan of overnight oatmeal, especially in the summer and I make it quite often. Yes, cold oatmeal can be delicious and this method comes out creamy and ready to eat. The oatmeal soaks up the milk overnight and all the work is done for you. And, the addition of the fresh fruit makes it that much better. 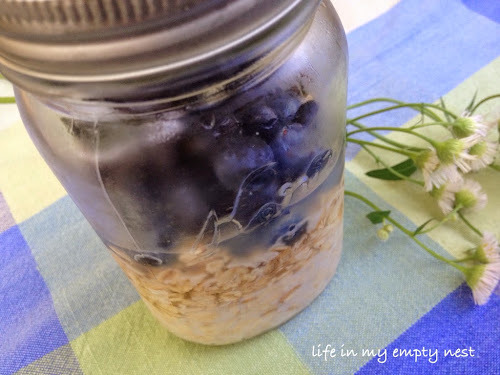 To make this easy and fun breakfast, the night before, pour 1/2 cup oatmeal in a mason jar. Cover with a drizzle of sugar free maple syrup and then pour in 1/2 cup low fat milk. Put a handful of blueberries on top of the milk and oatmeal, then drizzle with more syrup. Screw on mason jar lid and place in fridge overnight. Enjoy the next morning!